Africa has been well known for its cosmic lands rich with sunlight, vegetation and the wild. Like other jungles, it is a home to millions of celebrated species. It has also become one of the greatest advertised tourist hot spots; and people came from all over the world for the mere purpose of Safari adventure. If such lands are as abundant in resources as they say, why is it facing extinction? Why does deforestation in Africa continue to rise and take almost 5 million hectares annually, and why hasn’t it stopped for the past ten years considering the green movement’s focus on the matter? Like many rich forests scattered all over the Earth, the population in Africa is among the poorest of all groups. Almost all diseases hover in their lands, and food is scarcely provided for the people. If it is still not known to you, millions of communities perish every year due to malnutrition; and about half of the statistics reveal that the critically distressed and affected nation is Africa. Millions of people in all parts of Africa suffer from poverty, and the problem hasn’t been addressed to for many years now. About 217 million of the African population is now experiencing hunger, and these people divert to activities which can provide them with food. Truly, when life begets you of something, a person tends to deflect in other ways and seek measures to suffice their growling pit. Africa’s condition has been as pitiful ever since; sadly though, it has not received much aid from the neighboring worlds. When the African people found no means of getting food, they redirected to ways which can provide them with the money to buy their basic needs. Some of the population began to be laborers of huge logging companies while the others went to find their own fortune by cultivating plant and animal life. Thus, deforestation became a widespread solution for most of the African people; and since they are uneducated about its effects, they have mindlessly been doing harm to our world. When you see it in the bigger picture, you’ll be able to think that the problems of poverty are far from the issues of deforestation. 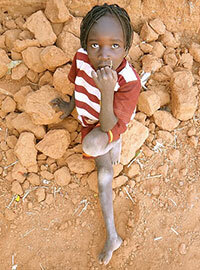 However, when you try to see things on a smaller scale, you’ll be able to see how poverty affects the bigger world. If this would go on in years, and the African nation still do not have means of responding to poverty, then deforestation would never come to an end. How can the African people make a real and lasting world when in fact they’re presently living in a very disturbed place? The actual question is where and how to start the changes in order to make the people survive and at the same time save the forests. Truly, big things can only be acted upon with strong movements. If the walls built are weak, then the support given will easily fall apart. Poverty is an issue that can be alleviated only with proper governance and aid from other countries. If Africa does not have both of these, then the need to establish strong financial incentives should be started. How things can begin is a question that can only be answered by their government. If honest and true people work for the survival of Africa, then saving the nation would be greatly possible. If proper guidance and aid will come, the deforestation in Africa will totally be forgotten; and the chance of survival for both Africa and the planet Earth is a promising thing to happen. Remember, the world needs better people, and one of them could be you.